Linz (Austria), Welkenreadt (Belgium) November 2015 – ‘Raven-Eye’ is the name of an internationally successful Austrian-Belgian development that uses radar to measure liquid flows in breweries, creameries, water supply works, as well as in municipal and industrial wastewater sewers. 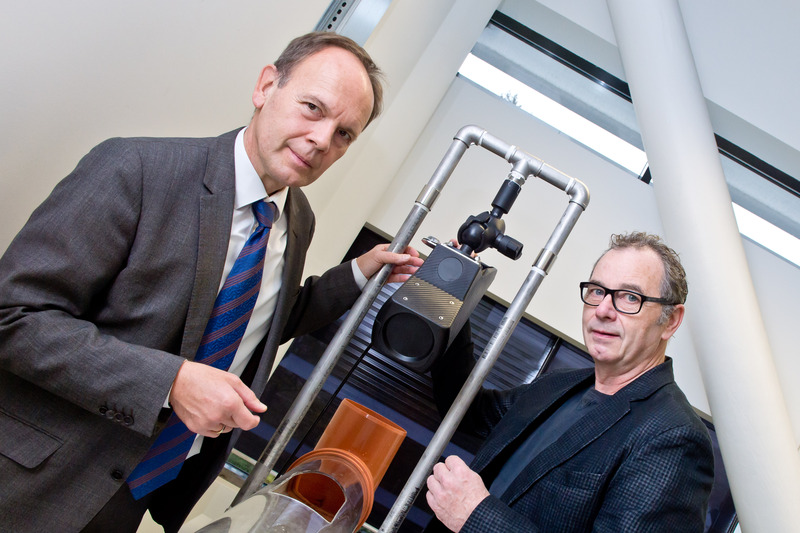 Flow-Tronic, a Belgian company, tasked the Linz Center of Mechatronics GmbH (LCM) with developing the product for launch on the market. As the non-contact, highly precise and simple-to-install Raven-Eye is also low-maintenance, this opens up unforeseen market opportunities. Flow-Tronic is delighted with the boom in orders from Russia, with overall revenues being expected to increase by 20 percent this year. In the meantime, the development coalition has just launched a second system, the ‘Beluga’, on the market and this measures liquid flows using ultrasound. “It was past time for our sector to get a technological boost,” says Karl Gerngross, CFO and partner at Flow-Tronic S.A./N.V. “There were clear market signals that innovations in flow measurements were long overdue.” Because measurement systems must, in many cases, be installed in existing systems, Flow-Tronic developed a system whereby lines didn’t have to be interrupted and processes didn’t need to be stopped. “Radar seemed to be the perfect technology for this – and LCM the perfect development partner,” emphasises Gerngross. Just how correct he was in this assumption can be seen in the result of the Austrian-Belgian cooperation. Raven-Eye measures the volume of liquid flows with the highest level of precision. LCM developed the entire electronics and software for this and also produced hardware prototypes. Precise measurement data and a complex algorithm make this unparalleled level of measurement precision possible. “Raven-Eye uses radar to measure the flow velocity from above the surface of the liquid. Meanwhile, the water level in the channel is calculated at the same time. This data is then used by an algorithm, which takes into account additional factors such as turbulences, waves or interruptions, to calculate the flow volume with unparalleled precision,” says LCM senior researcher Clemens Hesch, describing the principle behind Raven-Eye. All of this was possible thanks to the successful collaboration of LCM and Flow-Tronic, whose competencies perfectly complement one another. LCM has years of experience in sensors and signal processing. Flow-Tronic has unique expertise in the flow behaviour of liquids in channels and ducts of various dimensions and characteristics. “This experience, which was gathered over many years, coupled with the concrete measurement results had to be translated into an algorithm that would calculate the volume of the liquid flow,” Flow-Tronic founder and CEO Jean-Marie Sévar outlines the greatest challenge of the project. However, the Belgians have also invested considerably in this growth, having spent EUR1.2 million in research and development in recent years. And the R&D expenditure ratio will continue to be in or around 10%. “Flow-Tronic impressively demonstrates that investments in product developments offer the best return. The fact that LCM played a role here is all the more reason to be pleased,” explains LCM CEO Gerald Schatz. It only took about 18 months to develop Raven-Eye for launch on the market. “Because the cooperation with LCM went so well, we decided to immediately initiate a second project,” says Gerngross. This project also has a suggestive name: ‘Beluga’, called after the beluga whale, measures flow quantities directly in the liquid using ultrasound. Like Raven-Eye, the Beluga design is also optimised for minimum energy consumption. This means that both systems can be operated for several months in places that are difficult to reach without having to change the battery. The flow measurement system Beluga, positioned directly in the liquid flow, makes use of the Doppler effect. For this, Beluga emits ultrasound signals and these are reflected by particles in the liquid flow – like air bubbles. “The difference in the wavelengths of the signal being emitted and the signal being reflected provides the basis for precisely calculating the velocity of the liquid flow,” explains LCM researcher Hesch. As the flow velocity is slightly less at the edges, Beluga generates a velocity profile using a number of measurement results at various positions to illustrate the mean flow rate. As was the case with Raven-Eye, LCM developed the entire electronics and software and produced hardware prototypes from standard components for the launch of Beluga on the market. The interplay of housing and electronics design for ATEX certification is currently being optimised by LCM for Beluga and for Raven-Eye. This is required for use in explosive environments. “In wastewater sewers, methane gas is produced which becomes explosive when mixed with air. For this reason, many countries require all devices employed to have ATEX certificates,” Jean-Marie Sévar explains the investments in the versatility of the products. An upcoming EU directive could also prove to be a sales generator. In the future, any rainwater runoff that flows into drains will have to be measured. “These are precisely the application areas that require a fast, uncomplicated and precise solution. And the Raven-Eye is predestined for this,” says Sévar.